Power of purple foods that protect us against cancer and blood vessel disease should interest everyone. They are rich in the phytochemicals that are the reason why those who eat 8 to 10 coloured salads and fruits every day have a 33 percent lower all cause of death rate. That's very strong research, following them for twenty years. This page was last updated on 22nd November, 2018 by Dr Bernard Preston. Your purple foods are rich in phytochemicals like betalains and anthocyanins. Lab studies have shown that they inhibit the growth of tumour cells. Many folk grow beets not for their roots but for the leaves which are not unlike Swiss chard, only nicer, in my opinion. They are particularly rich in phytochemicals zeaxanthin and lutein that are known to provide protection to the eyes. Mulberries are another source of the power of the purple foods, and definitely one of my favourites. They are easy to grow, unlike strawberries simple to reap, and can be turned into scrumptious jams and jellies. Whether you enjoy the power of purple foods for their delicious flavour, or their health benefits, or both, just make sure they are amongst the eight to ten colours you try to eat most days. Power of purple foods that along with strawberries also give protection to the eyes. If in doubt, just google terms like betalains and anthocyanins, lutein and the like, and you'll soon be hunting for purple cauliflower, beetroot, blueberries and mulberries on the supermarket shelves. 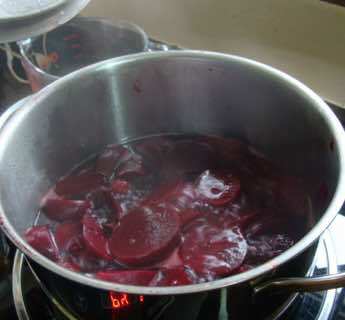 Beetroot take some boiling, and I recommend the pressure cooker which reduces cooking time by two thirds. How to cook beetroot provides a little more information if you're at loss; it took me a long while to learn about the virtue of using pressure to speed things up. They keep in the fridge for about five days; if you cook up a larger amount than your family can happily eat in that time, then it's better to pickle them. It's dead simple. Cauliflower is not the most exciting vegetable, lacking colour and flavour, but I'm looking out for those new purple varieties. I bet they taste better too. One important thing to keep in mind is that those foods with strong antioxidising properties are themselves readily vulnerable to the air; they don't keep and only those that are obviously fresh should be chosen. Better still start growing them yourself. Betaines are phytochemicals in purple and other foods, that enable the body to detoxify a nasty breakdown product of protein metabolism that is the major cause of blood vessel disease. What is betaine is an important page if you want to know why the power of purple foods is so important, says Bernard Preston. Some varieties of purple beetroot can be enjoyed raw too, thinly sliced. To grow your own healthy veggies like this you may need to get acquainted with what is a worm farm? If you want to enjoy really healthy, tasty food, start to think about what's being called urban agriculture. Could you plant a mini-farm in your own backyard. Pickled beets are probably the epitome of the power of purple foods; because they don't keep, a testimony to their antioxidant properties, it's best to enjoy them fresh, and immediately preserve what's left. Rich also in antioxidant vitamin C and other antioxidising minerals, pickled beets are a traditional gem. Really, these pickled beets recipes take just a few minutes to prepare. How to cook beetroot may be relevant to you; and how to cook beet greens. Bernie's beetroot soup, also known as borscht, is another of my favourites. 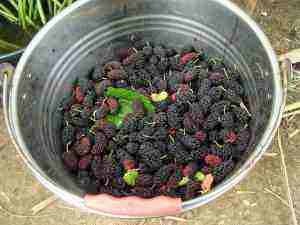 Mulberries are another of my favourite testimonies to the power of purple foods. The trees produce in abundance in temperate climates in late spring, the season lasting about a month; we enjoy them fresh with icecream and as smoothies and then the boss turns them into jam. 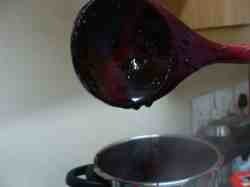 Compared to other jellies and jams, how to make mulberry jam, she tells me is a breeze. Getting the gel point right is the trick. 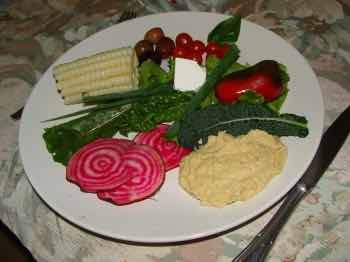 Healthy choice foods is what it's all about; enjoying as many coloured dishes as you reasonably can; amongst them there should regularly be the power of purple foods. I'm not into fancy cooking; good food, made fast, is our motto. If it's long and tiresome, then move on to something else. Nevertheless getting off the black and white diet is important; move up to colour, without becoming neurotic about it. I don't advocate counting all the coloured foods you've enjoyed today, once you're in the groove; but doing it now and then might be useful. Health nut neurosis is something I'm seriously concerned about as a doctor. Don't allow these issues to do to your mind what the black and white diet will do to your body. Orthorexia is first cousin to anorexia. This was a bad day; we enjoyed only two coloured fruits at breakfast, five salads for lunch and kale for supper; mind you, that makes eight. But it is important, not just for their antioxidant, read cancer prevention properties, but as a chiropractor I love their anti inflammatory nature. Bernard Preston is a writer with six published books and he's busy with the seventh. Enjoying a simple, yet profoundly healthy diet is one of his passions. Subjects like the power of purple foods comes up regularly; or red, green, yellow or other. Then there's part time chiropractic practice, fussing with his solar generator, and right now adding more photovoltaic panels to his roof; it would be nice to have 4kW of power coming in on a sunny day. Then we don't have to fuss if a cloud comes over, but if you have too little input energy then there are concerns if the solar electric stove, or dishwasher or lawnmower are busy.